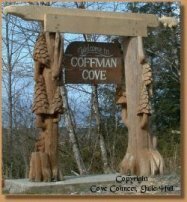 The City of Coffman Cove, Alaska Welcomes You! Sorry for the inconvenience but we are under maintenance and will be back up a running as soon as possible. Alaska's Hidden Secret On Prince of Wales Island! The scenery and wildlife are spectacular! Photograph bear, eagles, deer, and river otters in their natural habitat. Hike and beachcomb wilderness beaches and trails. Fish for salmon, halibut and bottom fish in world famous waters. Fish local lakes and streams for steelhead, rainbow trout, or dolly varden. Charter a local guide and boat to take you fishing. Rent your own skiff and go saltwater fishing. Camp in the great outdoors of Alaska. Scuba dive in coves and inlets in clear pristine waters. Kayak hundreds of miles of isolated and protected shoreline. Canoe the famous Honker Divide Canoe Trail. There is something for everyone! Go bird watching or whale watching. Dine on our world famous Coffman Cove Oysters. Take the family for a picnic and swim at Sweetwater or Luck Lake. Visit local towns such as Craig and Thorne Bay.